1753 The property of his brother in law, Robert. This included the site of the present hall. Failing heirs this property was to revert to Richard, son of Robert. 1753 Properties of his aunts, Elizabeth Gregg and Ann Inkersall. 1755 Properties of Eyre and Buller. 1759 Property of the Rector, Bernard Wilson. 1759 Property of William Pocklington, father of Roger. The exact position of these properties is unknown, but they could have been on the old road through the village, which later became the back drive to the Hall. (The Drive, Holme Lane, 1933). Unfortunately Ann, wife of the doctor, died in 1757, leaving no children, but two years later Robert married Elizabeth Mainwaring of Lincoln. She was thirty-three years old. He was fifty. She had £5000 dowry and he settled all his property on his wife and heirs. In 1761 the building of Winthorpe Hall began. On May 15th 1762, Doctor Taylor died leaving his wife and daughter Elizabeth. There was no money to complete the building, which remained untouched for three years. 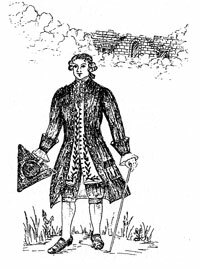 Dr. Taylor was buried in London, in South Audley Street Chapel, but his remains were transferred to Winthorpe sixteen years later, in February 1778. Roger Pocklington, the Newark banker offered £8000 for the Hall Property if a Special Act of Parliament would set aside the will. This was done in 1765. It was entitled "An Act for the sale of the copyhold estates late of Dr. Robert Taylor, deceased, and for laying out the money arising thereby in the purchase of other lands to be settled in lieu thereof." To prove the position of the widow it will be well to quote from this Act. "The finishing of the Mansion and the building proper, and suitable outhouses and offices will require large sums of money and the daughter is an infant. Robert Taylor not having made any provision for completing the Mansion House, and the infant not being possessed of any personal estate, wherewith the guardians could carry on the building, the Mansion House has continued in the same state as it was in at the decease of the said Robert Taylor, and will in a short time become ruinous and go to decay." Mrs. Taylor and her daughter returned to Lincoln where she died in 1812, aged eighty-six years. Her remains were interred at Winthorpe. Elizabeth had married and she erected a tablet in the church, to her father and mother. This tablet is now behind the organ. And of Robert Taylor their infant son. Taylor's of Winthorpe in Volume 4. Dr. Robert Taylor (2) in Names of Winthorpe. The Lords of Winthorpe Hall in Names of Winthorpe.